Rasmussen Global commissioned a report by independent international sanctions experts on the state of play and effectiveness of sanctions vis-à-vis Russia. The report challenges perceived wisdoms on measures currently in place:The “overall European economy appears resilient to the negative impacts of decreased trade with Russia”. European Commission and IMF estimates for 2015 put EU losses at cca. -0.4% of GDP versus up to -1.5% for Russia’s GDP. “Opposition to sanctions does not always correlate with heavier relative costs in export losses to Russia”; some of the EU members suffering the most are among the most avid supporters of sanctions. At the same time, a great many countries opposing sanctions – including Greece and Italy – suffered the least. 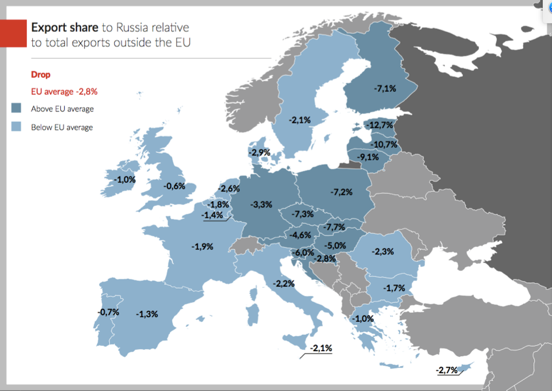 For example, Greece experienced only a 1% decrease in its total exports outside the EU due to lower exports to Russia but it is one of the strongest anti-sanction advocates. In contrast, Estonia suffered a 13% drop in exports yet remains one of the staunchest advocates of sanctions. The main drivers for some countries advocating for lifting sanctions are mostly political, not economic. Contrary to some narratives that claim sanctions are ineffective, they have ultimately worked; although they have not reversed Russia’s actions, the application of sanctions – especially the sectoral measures – have constrained Moscow’s actions in Ukraine. “The impact of international sanctions has been greatest in signalling to Russia and the world the consequences of violating norms on territorial integrity, international humanitarian laws and the resolution of conflict through internationally convened and supervised negotiations”. Present “sanctions against Russia could be adapted” or used more effectively. The report seeks to offer a more nuanced understanding of how, and in which ways, sanctions against Russia could be used for a better effect going forward. This could include further limiting “Russia’s financial room for manoeuvre” by increasing the number of targeted individuals close to the Putin regime or the number of entities and companies covered by already existing sanctions – without necessarily adding new sanctions. Increasing the duration of sanctions from six to twelve months can represent a form of strengthening without new measures. This could also pre-empt the possible hurdles of renewal due to Brexit – the UK being one of the leading advocates of sanctions. Another way of making sanctions more effective could be to link them to human rights violations in Crimea and Donbas. Sanctions could also benefit from a broader and strengthened coalition. The West should therefore work hard to get other regional powers such as India, Turkey, Brazil and South Korea on board. Coordination should also improve to target those trying to circumvent the sanctions. New political arrangements and mechanisms could also be negotiated between the EU and the UK in order to help the UK stay plugged in shaping EU sanctions policy. Lifting sanctions could “lead to an increasingly belligerent Russia”. It would also curtail the Western leverage vis-à-vis Moscow. A premature lifting of sanctions would call into question Western commitments to international norms and the ability to use similar measures effectively and credibly in the future. It would represent a major setback for the EU’s common foreign policy. “It could cause considerable strain on EU unity already under pressure from other ongoing challenges (refugees, Eurozone crisis, Brexit, instability in the Middle East and north Africa, terrorism)”.